Here's one of the new online slots game so get ready to do your best spandex, it’s time to wrestle for a very big payslip. Lucha Maniacs is a 5 reel by 20 pay-line slots brought to you from online slot juggernauts: Yggdrasil. This is a slot that can be played from as little as 20p up to around £100 per spin. 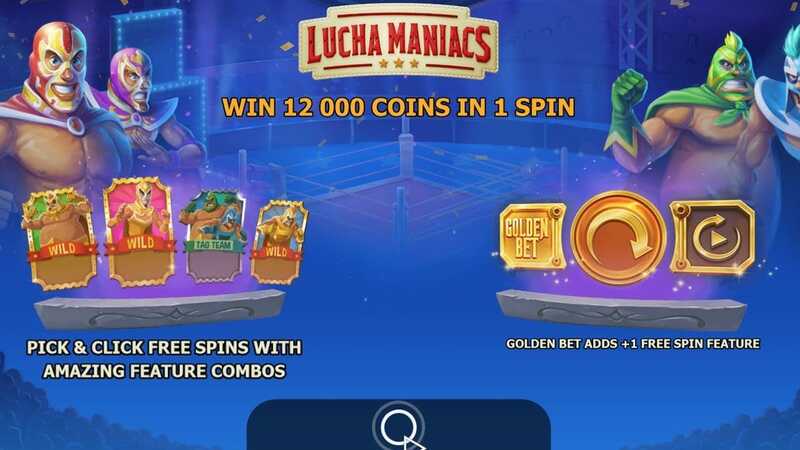 One has the opportunity to play Lucha Maniacs on a handful of different devices, including mobile, making it very easy to play this slot anywhere and at anytime. There are a variety of additional features at play here, all of which can be as useful as a steel chair in a no disqualification match. We will get into these in due time, specifically later in this review. The look of this slot is very bright and bold. Lucha Maniacs is a 3D slot that’s the main goal is victory between the ropes. A lot of the characters here reflect luchadores from history. Blue Demon Jr, Rey Mysterio, Psychosis, Matt Classic, Justin Thunder Liger, all are given references in this slot, it’s very clear that the attention to detail here is one of the biggest takeaways from Lucha Maniacs. Be sure to check out the rest of our review below to see if Lucha Maniacs is the bout for you. If you love promo's, claim casino bonuses today. If you’ve yet to play a Yggdrasil slot before, then you’re in for a treat. Founded in 2013 by former NetEnt CEO Fredrik Elmqvist. Based in Malta, Yggdrasil is at the forefront of innovation. With every new release from Yggdrasil comes the inevitable excitement for what comes next. What theme, when will it come out, why isn’t it out yet? These are all questions one might ask themselves once they’ve started playing any of Yggdrasil’s previous titles. Creativity is not something that can be taught, only influenced by existing materials, however Yggdrasil seem to have creativity in droves, inspired by their own work, which in turn can be seen as inspiring in itself. When you hear Yggdrasil you will think success, believe us in that. The main goal in Lucha Maniacs is to aim for those free spin games. This is where the money lies, it will require a lot of physical and mental stamina. In order to unlock these free spins you will be needing to match various scatter symbols in repeat succession. The more scatter symbols you match the more free spins you win, it’s really that simple. There are up to 30 free spins available depending on how many of the scatters you match. On top of that you have the various wilds that appear on these reels, the wild will substitute various symbols on the board for the matter symbols thus providing you with an alternate avenue for getting those free spins. In Lucha Maniacs there is also sticky wilds that will stay fixed in place until they are matched within the winning pay-line. Be sure to wear your favourite wrestling mask when playing this slot for full effect. Lucha Maniacs is chocked full of matches fr you to choose from. You’ll be missing out on some big wins should you avoid Lucha Maniacs. Play now! If you enjoyed this game you might also like Chitty Bang.